The world has undergone massive transformation with the advent of technology. These digital advancements have impacted every sphere of human existence in an enormous way. Digital transformation has brought incredible changes in education sector too. Today’s generation is fast paced, restless and full of energy. Hence to harness & utilise this energy our educators constantly need new ways to keep them engaged constructively. Also, every child is born with its own unique grasping & learning power. This is where technology can be an asset to accelerate their learning capabilities through personalised & digital learning strategies. Digital advances, (particularly with the advent of social media), have taken learning in a new direction. It has steadily shifted the landscape of learning from instructional to self-exploratory. Call it addiction or a new way of learning, but today we are far more likely to reach for internet to learn something that excites us rather than finding a relevant book or visiting the library. The advent of Internet has made it abundantly clear that online sources of knowledge such as Google, YouTube and Wikipedia are the new instruments for global learning. Introduction of Massive Open Online Courses (MOOCs) has further brought a major change in traditional learning models of education. It has democratized learning itself. Advances in digital technologies has given easy access to information leading to more profound engagement of learners depending on the user experience. At work places, digital learning is enabling greater interconnectedness between workforces. Enterprises are evolving into more participative communities giving rise to vital trends such as social learning. 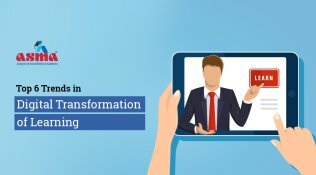 Here are a few major digital transformation trends that have brought humongous impact on education & learning abilities of students in modern era. With the inclusion of internet in the classroom, the old classroom set-up is now been replaced with smart classrooms. As more and more schools and colleges begin to embrace digital transformation, the dull & mundane black boards have found an intelligent replacement with smart boards. Smart classrooms are capable of tracking and measuring performances and efficiency of the class through various connected IoT (Internet of Things) devices. The inclusion of tablets, eBooks enabled with educational software and applications have given education a millennium face. Digital transformation has enabled a robust student management system. Teachers can now evaluate and track students’ performance and attendance with click of a button. Similarly, students can submit assignments online. A lot of manual work of teachers and students have been eliminated by digitalization of education. The term personalized learning, refers to a diverse variety of educational programs, learning experiences, instructional approaches, and academic-support strategies that are intended to address the distinct learning needs, interests, aspirations, or cultural backgrounds of individual students. (Source: https://www.edglossary.org/personalized-learning/). To accommodate this concept, teachers & academicians need to develop new methods & approaches to teaching techniques. In order to administer this need of individualised learning, digital interventions serve as a great tool for the students in which content, instructional technology, and pace of learning are based upon the abilities and interest of each learner. Blended learning isn’t just an addition of technology into the classroom but is intended to make teaching and learning more engaging, personalized and effective with the use of smart technology. The digital environment provides new tools for students to develop critical thinking skills with deeper conceptual understanding. This approach strengthens students’ ownership in learning. The concept of blended learning encourages students to perceive a thought or an idea, make their own discoveries, reason & research it out at their own pace. Blended learning system also strengthens self-learning. With the use of technology, students can curtail too much dependence on books and teachers for acquiring knowledge. Adaptive learning is an extension of & similar to blended learning. This method aims at creating modular learning environments where students’ decisions are captured, analysed & then used to guide them further. It also facilitates teachers in assessing formative & summative data of students. This methodology reinforces & fortifies teachers to improve their teaching skills & for students to improve their learning skills. It helps both to identify their strengths & weaknesses that need attention. As the heading suggests, in a digital environment student led learning is controlled by students i.e. students are in charge of their learning. In student-led learning classrooms are designed around the learners need. The millennium classrooms are well equipped by modern tools such as wireless presentations & mirroring devices that ease out the learning process. Students are encouraged to generate ideas, take their time to analyse it & then present it in the class. Such methods amplifies the voices of even the shyest learners. Students are assigned projects that encourages them towards self-directed learning. The whole teaching-learning process becomes engaging and motivating, plus the skills students learn while planning, executing and sharing their projects permeate the rest of their learning. Through smart learning suites, students are encouraged to teach each other and give feedback on their fellow students work. In such an environment, peer learning helps students to develop interpersonal skills which in turn magnifies their confidence. The cloud – based technology enables students, instructors, guardians and staff to access digital content from any gadget and from anywhere. If you store data in a cloud, your information lies safe and secured with the service provider, making it accessible anywhere / anytime. Teachers can create collaborative classrooms using cloud based web services such as Microsoft Office 365 and Google Classroom. It allows them to organise class materials and prepare online assignments with web content, embed audio and video from any device. Then, easily collaborate with students and colleagues. Cloud based teaching offers some of the greatest benefits to education by bringing students together in a collaborative space for giving them individual support by teachers. If you have more ideas to share on how digital transformation of learning is bringing a paradigm shift in our education system, please write to us through your valuable comments on this blog. We will include them in our testimonial section on home page of this portal with your name.